Livingroom's Private Collection is a discreet method of selling or renting property. Our quietly confident approach has proved popular and Livingroom is recognised for our more tailored approach. 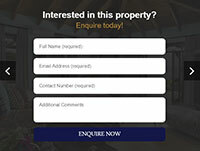 A substantial volume of our sales have been 'secretly sold' to perfect waiting buyers who we have had the pleasure to meet and understand their unique requirements.